SOK SOK is practicing hard for the upcoming matches held this September. Photo provided by SOK SOK Ewha. SOK SOK Ewha participated in the last year Special Olympics Korea. Photo provided by SOK SOK Ewha. Among the great student athletes at Ewha, there is a unique volleyball team named SOK SOK Ewha. Started by students from the Department of Special Education and the Division of Kinesiology & Sports Studies, students gathered to start a sports club where people with and without disabilities can enjoy sports together. That summer, Kim and her friends gathered to start a volleyball club called SOK SOK Ewha. They gathered Ewha students who were capable of teaching volleyball and disabled people outside Ewha who are interested in learning volleyball. 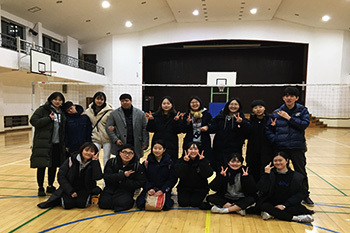 Since that fall, members of SOK SOK Ewha gather every Thursday at a gym near the school to practice volleyball and prepare for the Special Olympics Korea (SOK). The SOK, which is mentioned in the name of the club, is an annual sports game held in Korea for athletes with developmental disabilities. While it may seem similar to the Paralympics, Special Olympics Korea is for those with developmental disabilities. SOK SOK Ewha aims to participate in the 2019 SOK which will be held this September. Along with their regular volleyball practice, they watch volleyball matches together. They also participate in the Special Olympics Korea Youth Summit to argue for the rights of developmentally disabled people. Kim lastly shared that the club does not aim for winning games, but to learn how to work with others. Volleyball is just a medium for the members to become friends, either with or without disabilities. Kim added that not many people are aware that the disabled do not have much chance to enjoy leisure time. Though recognition of professional disabled athletes has risen since the Paralympics, Korean society still lacks attention toward amateur people who also want a chance to participate in sports games. She hopes that more developmentally disabled people in society will have a chance to enjoy various types of leisure in the future and the club to be a stepping stone for it.